Discovered by Pierre Méchain in 1782. Messier 107 (M107, NGC 6171) is another additional object found by Pierre Méchain in April, 1782. Herewith, it is probably the Messier object which was the latest to be discovered. 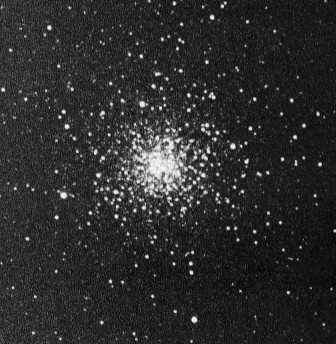 Eventually, Helen Sawyer Hogg added it to the Messier Catalog in 1947, together with M105 and M106, although it appears probable that already Méchain had intended to add it to a future edition of Charles Messier's list. 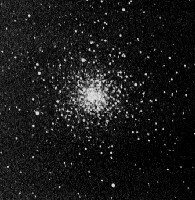 William Herschel, who had independently discovered it on May 12, 1793, cataloged this object as H VI.40; Herschel was the first observer to resolve this globular cluster into stars. M107 apparently contains some dark obscured regions, which is unusual for globular clusters. The star distribution is called "very open" by Kenneth Glyn Jones, who points out that this cluster "enables the interstellar regions to be examined more easily, and globular clusters are important `laboratories' in which to study the process by which galaxies evolve." Visually, M107 is about 3 minutes of arc across, while in photos it extends over a region more than 4 times this diameter (about 13'). As its distance is about 21,000 light years, this corresponds to roughly 80 light years. M107 is approaching us at 147 km/sec, contains about 25 known variables, and as a globular cluster, is of intermediate metallicity (abundances of elements heavier than Helium).